Yamaha are kings when it comes to delivering a quality guitar at a wallet-friendly price, with guitars in their Pacifica collection spanning from the premium PAC600 series right down to their impressive entry-level instruments. 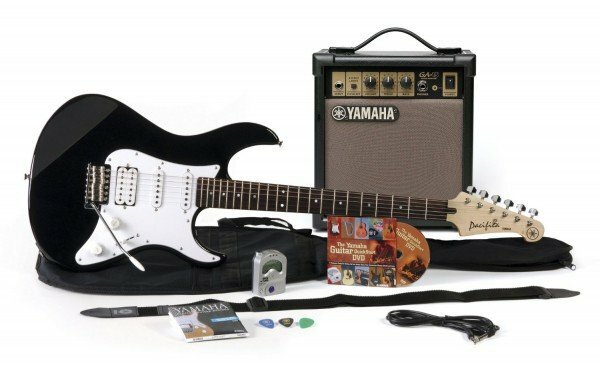 And their Gigmaker package is one of the latter – an affordable combo pack aimed at beginners, but with the quality an experienced guitarist could appreciate. Along with offerings from Epiphone and Squier, Yamaha’s Pacifica 012 is usually one of the first on the list when it comes to rounding up the best entry-level guitars. The reason is simple – because they make a small budget go a long way. The guitar features the familiar, well-defined Strat-style double-cutaway body made from solid agathis (similar to basswood), so it’s lightweight and comfortable for longer practice sessions. It comes in a range of colors, including the no-nonsense Black, a vintage-inspired Old Violin Suburst, and a cool Metallic Red. There’s also a bolt-on maple neck, with a sonokeling fretboard and 22 frets. The hardware on the guitar is simple but effective, with three pickups giving you a range of tones and the ability to play pretty much any style of music. There’s a humbucker at the bridge position, with a single-coil at the neck and another single-coil in the middle. These are controlled by a five-way pickup selector switch, as well as a master tone and master volume control knob. Pretty versatile for a guitar in this budget category, and you’d be right at home playing jazz as you would heavy rock. You’ll also find a vintage tremolo bridge, with whammy bar, giving you scope for vibrato effects. Looks great, plays well, and offers good sound – what more can you ask for? 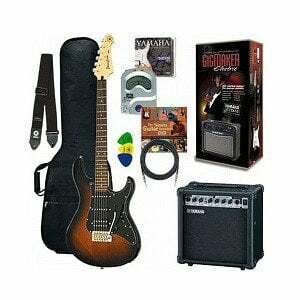 As part of the Gigmaker pack, the guitar comes bundled with an amplifier and essential accessories. The amp is Yamaha-made and branded, and offers 15 watts of power – excellent for band practices with enough volume for small gigs. The natural overdrive this amp offers is superb, and the controls are slightly more advanced than some other amps in the starter pack arena. It offers volume, bass, middle, and treble controls, as well as separate gain and volume controls for the overdrive channel, not to mention a dedicated clean/drive channel switch. Aside from the amp, you also find a host of accessories – none of them are particularly special, but what you get is a convenient way to be playing straight out of the box. These include a gig bag, a cable, a strap, plectrums, and a very handy clip-on digital tuner. There’s also a Quickstart DVD, which will hold your hand as you begin your guitar journey. The Pacifica 012 really is a joy to play, and looks awesome in whatever color you choose. Paired with the quality Yamaha amp, you get a sound that can offer more than just clean and crunchy – with the right settings you can find everything you need for hard rock and metal. The whole package may be a little more pricey than similar combos from other brands, but you really do get what you pay for – a quality starter set that will allow you to develop into a good guitarist. For more info about the Gigmaker, click here. For more beginner electric guitar packs, click here.